Look, I’m just going to admit at the outset that the premise of “Baby You Can’t Drive My Car” invites a lot of car metaphors, and that I’m not going to be able to resist all of them. I’m only human, here, people, but I’ll try to control myself. There’s a fair amount of, lets call it “echoing” going on in “Baby You Can’t Drive My Car.” CarGo’s too-good-to-be-true campus and benefits feel a lot like those of the Globex Corporation. And if the data-miners here aren’t interested in blowing up bridges or taking over the Eastern seaboard, their amoral money-grubbing deceitfulness emerges as something even more realistically sinister. Hopping shows, CarGo’s sneaky user agreement manipulations sound an awful lot like those of Parks And Recreation’s Gryzzl, whose promised largesse came attached to some similarly Trojan Horse-esque legalese. Still, LaZebnik manages to make the issue feel uniquely personal here, thanks to how he paints its effect of Marge and Homer’s relationship. Homer and Marge have been thrown together in a work environment before. 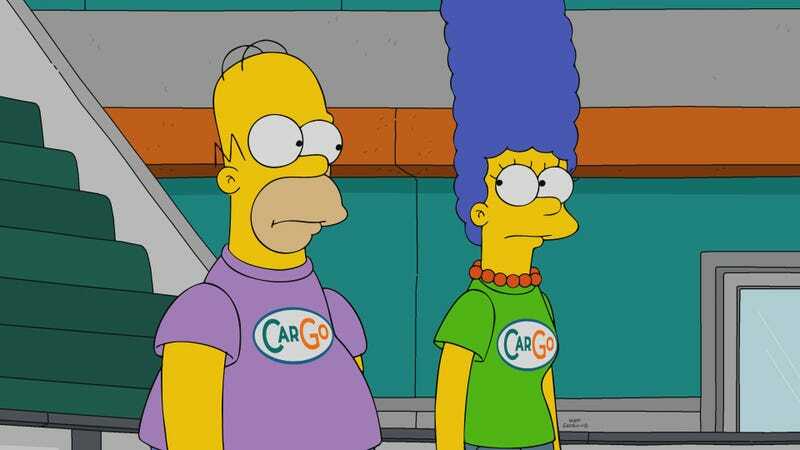 So have Marge and Burns, whose past episode of Burns’ workplace sexual harassment is referenced once he and Smithers join forces with the Simpsons in order to shut down CarGo to save the suddenly worker-depleted nuclear plant. (Burns claims he’s sworn off the “perils of sexual attraction in the workplace,” much to Smithers’ annoyance.) Again, The Simpsons’ longevity means that most combinations of players and conflicts are going to recur. The trick is to ground each new permutation in character. (If you can toss in a little nod to continuity, it’s appreciated at this point, but far less necessary.) So, here, it’s genuinely refreshing to see Marge and Homer finding that their unexpected partnership makes for a rejuvenating closeness. Meanwhile, Burns’ mercenary alliance with Homer (who he’d just fired) makes sense, too, with his gleeful “For the first time ever, I’m the lesser of two evils” striking a note of camaraderie that’s almost human. As for Marge and Homer’s story, the plot seems to cast them into antagonism without much logic. Homer is the one who gets up in arms about the data-mining, while Marge, swept up in all the good their joint venture is having on their marriage, at first decides that a company secretly stealing every scrap of Spiringfielders’ personal information is an insignificant price to pay. “I can’t be the ethical one!,” protests Homer at one point, and, well, he’s got a point. It’s sweet to see Marge and Homer dancing a graceful waltz in a virtual reality ballroom, and Marge’s anguished excuse that “we were having so much fun!” is pretty heartbreaking when you think about it. But the conflict just doesn’t land, and when Marge (horrified that CarGo plans to extend the listening-in to the cars’ key fob—even in the powder room) finally decides to help Smithers, Burns, and Homer’s sabotage, it’s too thin a motivation. Still, an episode like this one feels like LaZebnik and the writers room is making adjustments, steering The Simpsons incrementally back in the right direction. And that’s one measly car metaphor. Apart from Homer’s disastrous beard, the episode looks very good. The crisp colors and backgrounds pop, and there’s an upside-down visual gag in Homer’s opening car crash that’s executed perfectly. After Smithers touts CarGo’s enlightened LGBT policies, Burns scoffs, “What’s that, last goof-off buffoons, and . . . transgender?” Switcheroo.